Ranking for the right keywords is impossible without thorough and on-point keyword research. Think of yourself as a captain, your site is your ship, and keyword research is your map. Whether you are going to get stranded or find a treasure depends a lot on how you use that map. Powered by Big Data, Ahrefs is a prominent all-in-one SEO toolkit that can dispel all your doubts and concerns about your marketing campaign and finally move the needle. So, if you don’t have an Ahrefs account yet, you can try us with a 7-day trial for $7. With that option, you will have access to both Lite and Standard plans without any additional limitations. And the trial is more than enough to unleash Ahrefs’ potential and put its features to use. 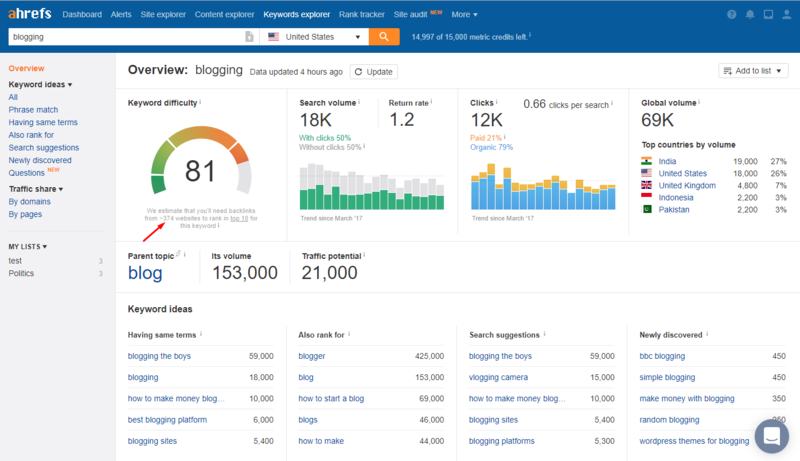 Some of the things you can do with Ahrefs include: competitor analysis, backlink analysis, rank tracking, link building, site audit, and, of course, keyword research. 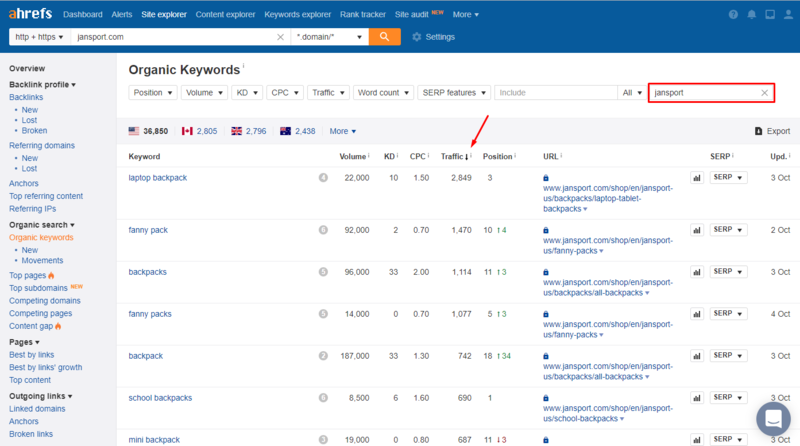 Without further ado, let’s get started with an actionable SEO tutorial for keyword research with Ahrefs. To have a better idea of what you are going to work with, go to Site Explorer, type in your domain name and go to Organic Keywords report. It will show you all the keywords your site is already ranking for on Google. This is a great way to see what route your business is going as well as to find underperforming pages that deserve your attention. 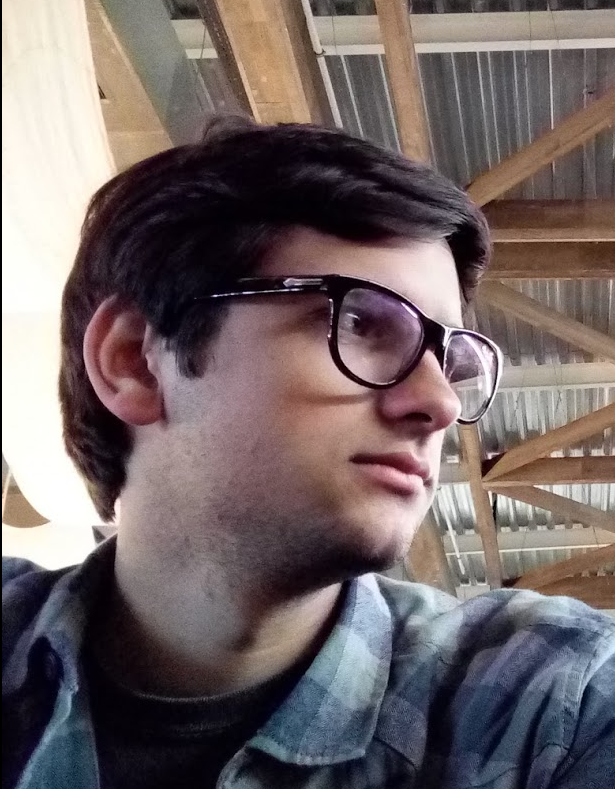 Feel free to sort the keywords by position, search volume, etc. Your goal here is to get to know your site and figure out what you should focus on in the future. Also, don’t get upset if this page is empty for you. For those who just started off not ranking for anything is absolutely normal. In this case, you can proceed to the next section in this guide. But if you do rank for some queries, go to Top pages report in the left sidebar that shows the pages that bring the most traffic to your site. Next, to the traffic estimate, you will see its percentage, estimated value, and the keywords the page is ranking for. Once you are done checking your current keywords, you might want to go back to the Overview page and look at Organic Traffic number. It’s an estimate of the traffic your site gets from search results. Hence, it’s based on the keywords you rank for. That figure can somewhat vary from what you could see in Google Analytics, but it’s an estimate after all. Nonetheless, this metric is indispensable for comparing websites. It’s the fastest way to see who performs better keywords-wise. So keep that in mind when you study your competition in the next step. Competitor analysis must always be a huge part of your SEO work. Know your enemy, as the saying goes. Alright, they are more of your opponents. But it still holds. You do need to have a clear idea of what they are doing and what you should do to outplay them. The first rule that you need to learn is that if something works for your competition, chances are it will work for you as well. So, when analyzing other websites, pay attention to who links to them, what kind of keywords they target, etc. It’s especially handy if you don’t have any concrete strategy at the moment. 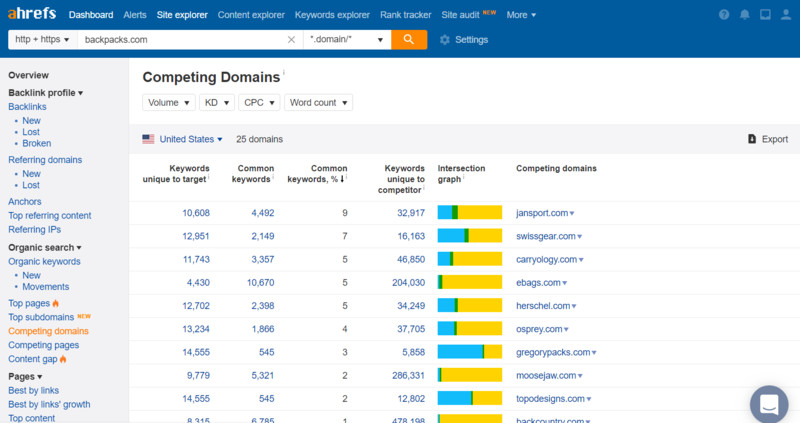 So, one way to go is to open Competing domains report that gives a list of your top competitors along with a keywords comparison table. There, you can see how many unique and common keywords those domains have in relation to you. 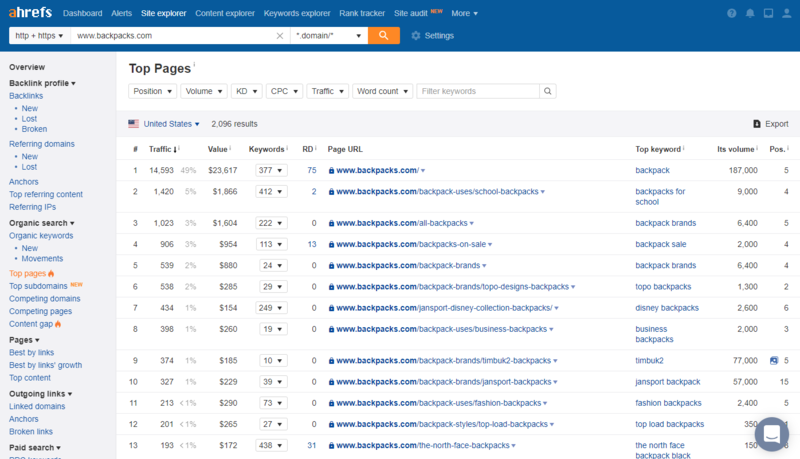 Let’s take a peek at the first competitor’s organic keywords, like jansport.com that comes first on the list. And this is where the fun begins. As it’s a famous brand, their site is ranking for roughly 80k keywords in all countries. Too many to look through manually. So, we would need to apply some filters magic. First, exclude all keywords that contain their brand name “jansport”. And just like that, we left out a good 16k keywords for the US only. Note, it can be an optional step if you re-sell this very brand’s products. These traffic numbers are helpful in finding out what people are interested in when looking for a particular product. The top query on our list is “laptop backpack” which means that it’s probably quite popular and generates a considerable amount of traffic. Take some time to sniff through these keywords and cherry pick the ones that are related to your business. For example, if you don’t have any backpacks for children, there is no use in targeting those keywords. Build your own list of keywords that you want to dig into deeper. Those will serve you as seed keywords, or a starting point, for your further research. Once you’re finished selecting, run a manual search for your keywords on Google and see what comes up on the results page. Just to find out what kind of content helps to rank for this or that keyword. Obviously, you are very unlikely to rank for such weighty keywords like “laptop backpacks” right away. You need to go beyond that and find a more sophisticated way of choosing keywords. An informed decision on whether some keyword is a perfect match for you needs to be based on the data and numbers behind that keyword. And you need to know how to make sense of them. At Ahrefs, Advanced metrics represent the essence of every keyword. They deliver the most important information and are great indicators in keyword research. The first metrics on our list is, of course, search volume. Search volume stands for monthly searches of a specific keyword. Basically, how often people google for something. As a little side note, search volume can be dependent on seasonality. For example, “last christmas song” is searched a lot more end November and during the winter holidays, so is “coats”, etc. I think you will agree that it’s pretty straightforward. But not really. The thing is, ever since Google seized to be a list of plain search result links and introduced Featured Snippets, SEOs realized that they need to take a different perspective on keyword research. And the fact that sites rank for highly competitive keywords doesn’t really mean that they actually get a lot of organic traffic from them. Here’s where Clicks come into play. If the number of clicks is low, it probably means that the answers to the search query are already shown on the results page. Images, knowledge card, you name it. These two graphs below show the statistics for “dr martens” term in the US. Not only can you see the percentage of clicks to the total searches, but also how many clicks the ads get. So, 0.94 clicks per search sounds great, but nearly half of them go to the ads. Which is quite a big share if you ask me. It’s a red flag that this keyword is highly competitive, and you should find something more realistic. So, what do you do here? Luckily, you can resort to keyword ideas reports that are just the thing for you if you are looking for related but less ambitious keywords. Also rank for – a keyword ideas list that shows you what other keywords the top 10 pages for your entered keyword rank for. Search suggestions – this list shows search suggestions that come from autocomplete when you type in your keyword. Newly discovered – shows phrase match keywords that we discovered recently. 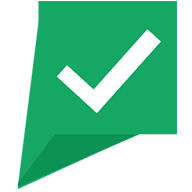 Questions – this report shows you search queries with your keyword phrased as a question. The latter idea type is one of my favourites. The reason is that you can see right off the bat what people are curious about and what they are looking for on the Internet for your keyword. Go to any of those reports, and feel free to narrow down your scope with the help of the filters above. I would recommend setting the word count to 3 or 4 words, adjusting the search volume filter to your needs. Play a bit with the filters and find a perfect combination for you. Yes, only 1.000 search volume, but pretty much zero paid traffic, high CTR (click through rate), and what is also important, it’s a fabulous idea for a blog post. If you ever bought clothes online, you probably experienced that difficulty to choose the right size. And Dr. Martens is not an outlier here, with a wide collection of unisex shoes. 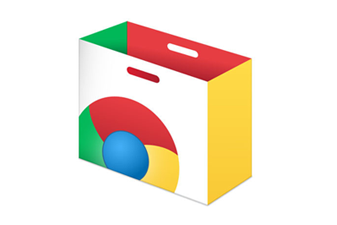 Which means people will look up for some useful information before buying the product. Put it simply, the probability of your potential customers reading your article is quite high. Create an amazing piece of content, feel free to give some examples, maybe a couple of videos. Make it as engaging as possible and convert your visitors into your leads. Because if they are impressed with the quality of your content, they wouldn’t probably go anywhere else and instead would gladly check your store. All in all, it’s a matter of finding the balance between granularity (long-tail keywords) and profitability. 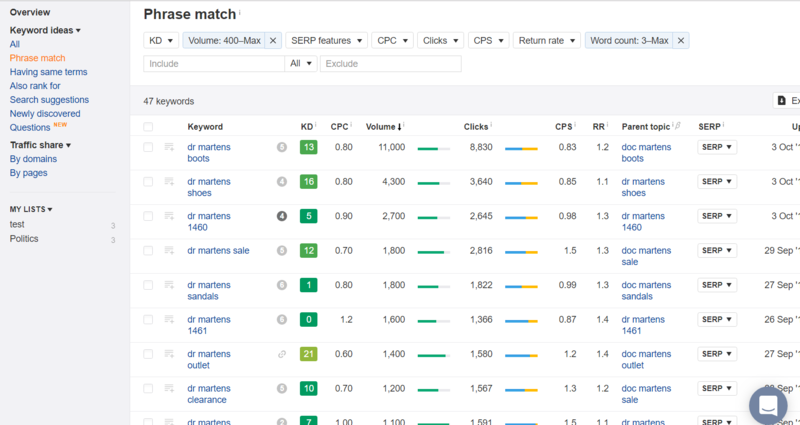 Use keyword ideas to be inspired and advanced metrics to pinpoint the best options. With this approach, you can easily generate tons of articles and schedule them for months to come. When looking through advanced metrics, you probably noticed the KD column. To make your keyword research easier, we came up with a keyword difficulty score. It’s based on the backlink profile of the top 10 search results on Google. And what it does is show you how many links your page would need to rank in those top 10. It’s by no means a guarantee but rather an estimate that should leverage your calculations. You probably don’t want to spend time on creating content around keywords you are not able to rank for. Because backlinks still have an enormous impact on rankings and can’t be ignored. If you are in SEO business, you might be surprised how many referring websites you would need to rank for “blogging” keyword. Yes, it’s clearly a highly competitive term, but it doesn’t hurt to see how competitive, right? Your strategy here is to find low competition keywords that can boost your site’s visibility. Even though KD is a significant factor, this is not the ultimate authority. So, don’t attach too much importance to it. Instead, use it as another variable in your equation. Now that you built a bigger keywords list, you need to put those keywords into “brackets”. Split them into groups to better understand where and how you can target them. This list can go on, but you need to focus on what your niche demands and what your business is going to provide. Whether it’s consulting, retailing, SAAS, figure out what people expect to see when they are searching for a query. Each of those intent types can bring different business value to your site. As your goal is to make revenue, you should be most interested in whether those keywords will generate leads. And not only visitors. On a scale from 0 to 10 (or whatever you are comfortable with), try to gauge the capacity of each keyword to make money. Getting back to the “dr martens” topic, people that google “dr martens looks” probably want to find new ideas for their outfits and not to purchase something. Use your common sense here, that’s the easiest route. Finally, when you have all pieces of the puzzle, you can prioritize your keywords in terms of resources, competition, time, monetization, etc. All your work comes down to this very step. Keep in mind it’s the constellation of factors that actually matter, not one of them. Finding the right keywords for your business is not an easy task. You need to pick a solid approach and use some effective strategies that can bring structure into your keyword research. Begin with your own site, study it to the details. This will help you understand where you are at the moment. Next, research your competitors, see what keywords bring the most traffic to them. 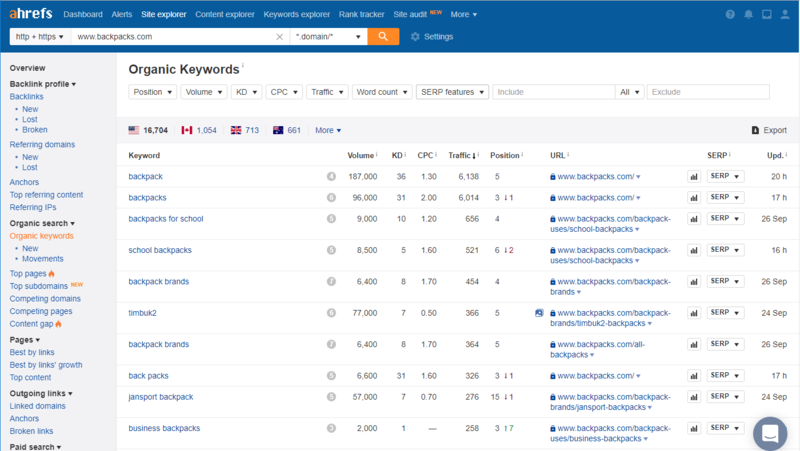 Use those keywords as seed ones and generate keyword ideas with Ahrefs. Sift your extended keywords list with the help of Ahrefs’ advanced metrics. Lastly, analyze and group those keywords by search intent, monetization, business value, etc. Select the ones that can be profitable for you. Hope this step-by-step guide cleared things up for you and made your marketing campaign less challenging. Good luck!